Brazilian firm Studio Arthur Casas has worked with a startup to create a highly flexible, prefabricated home that avoids the "negative surprises" typical in conventional projects. 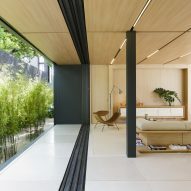 The 200-square-metre dwelling recently won a top prize at the São Paulo edition of Casacor, a series of architecture and design exhibitions that take place throughout South America. 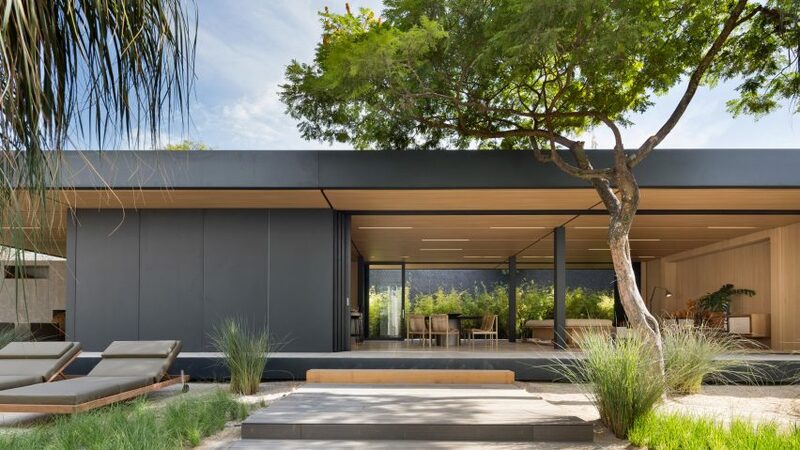 The house was designed by Studio Arthur Casas in collaboration with SysHaus, a Brazilian engineering and construction startup that aims to create attractive, eco-friendly homes that can be built quickly and purchased with relative ease. Currently for sale, the dwelling starts at approximately $1,900 (£1,470) per square metre. "The SysHaus house brings a new concept for contemporary living, where efficiency, practicality and sustainability are not only ideal, but also effective practices," said Studio Arthur Casas in a project description. "Efficiency also happens in the purchase, where the customer buys the house as a product, customising and choosing options with defined prices. There are no negative surprises, common in conventional constructive systems." The team's debut model – which can be designed and constructed in six months – is a single-storey bar encompassing one bedroom, two bathrooms, and an open-plan kitchen, dining area and living room. Retractable glass walls facilitate cross-ventilation and provide a strong connection to the outdoors. Flanking one side of the home is a deep covered patio with a concrete fireplace. 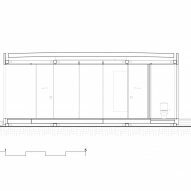 Wrapped in recycled aluminium cladding, the dwelling has a steel structural frame that is meant to be highly adaptable. "The structural system is composed of pillars and beams with the same section, connected by a metallic cube that works as a structural node," the team said. 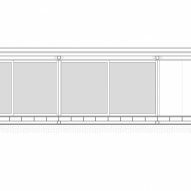 "When combined, they can result in different configurations of layouts and attend to several programs within a limit of up to three floors, either in a flat or sloped terrain." 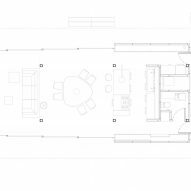 Providing a high level of flexibility was also a guiding concern for the interior design. In the kitchen, the team installed freestanding racks and cabinets, which can be reconfigured as needed. Customers can also choose from a range of finishes and coatings. In the showhouse version, ceilings and walls are wrapped in medium-density fibreboard, and floors are covered in cement tiles. Most of the decor was designed by Studio Arthur Casas in partnership with manufacturers, from a petal-shaped dining table to a floating credenza in the living room. The team used a neutral colour palette throughout the building, lending a sense of calm and elegance. The "ecosystemic" home has a number of sustainable features, including photovoltaic panels, a rainwater capture and reuse system, and a biodigester that converts organic waste into gas for use in the kitchen and fireplace. Buyers can add a green roof, which helps provide thermal and acoustic comfort. The SysHaus is also intended to be equipped with smart-home technologies, such as locks controlled by a mobile phone. The SysHaus joins an ever-growing collection of prefabricated dwellings for 21st-century living. Others include a metal-and-glass cabin by Danish retailer Vipp, which comes filled with the company's homeware products, and a factory-made dwelling by LA-based firm Cover that was designed using computer algorithms. Photography is by Filippo Bamberghi.